Install gauges and check all operating pressures. Check that crankcase is operating. Check air temperatures across indoor coil. Check air temperatures across outdoor coil. Check for noise and vibration. Check emergency heat switch operation. Our On-Demand Performance Tune-Up has a value of $160. 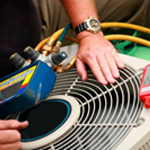 We also offer annual service agreements starting at $165 and $125 for each additional system.